OmniTurn mmmmmmmmmmmm Made in Oregon! Gang-tooled for fastest tool changes. 75° slant-bed lets chips fall away quickly. 12” X-Axis travel; 9” Z-Axis travel. Highest quality ground ball-screws and linear guides for precision and reliabilty. Closed-loop servo system provides .0001” accuracy with .00005” resolution. Gang-tooling is fast ! Tool to tool in less than 1/2 second. Gang-tooling is fast for repeat setups! OmniTurn’s “Save Offsets” feature lets you setup a complex repeat job in just minutes if you’ve saved your tooling in this 805PFB holder. Just re-locate the holder on the tooling plate and load your part program with offsets and you’re ready to run parts in minutes. No need to re-set all your tooling. The locating pin insures that the holder is back in place, and the original offsets load into the OmniTurn with the program. 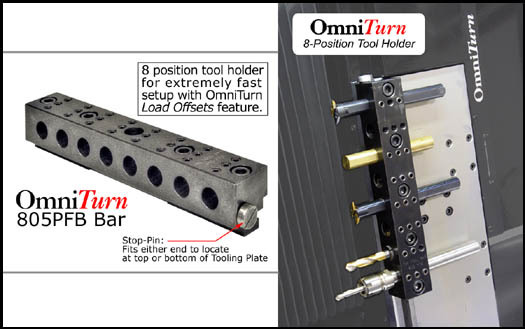 The OmniTurn 805PFB (pictured above) is an 8-station tool-bar that accepts 5/8” tooling on 1.1” centers. Stop-pin fits either end so bar can be located on either side of OmniTurn tooling plate. OmniTurn “Save Offsets” feature instantly retrieves offsets when program is loaded, so repeat jobs can be re-set in minutes. 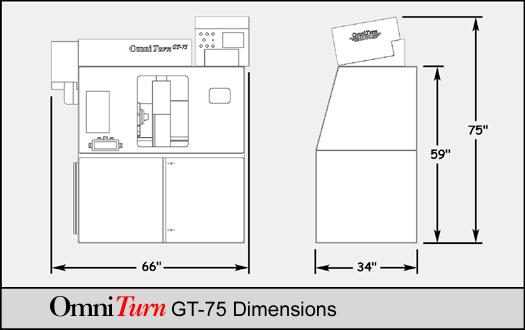 Shown at right on OmniTurn GT table. Note that the steep 75° angle allows chips to fall away quickly into chip-pan. $225. Axes Thrust . . . . . . . . . . . . . . 500lbs cont. 750lbs int.